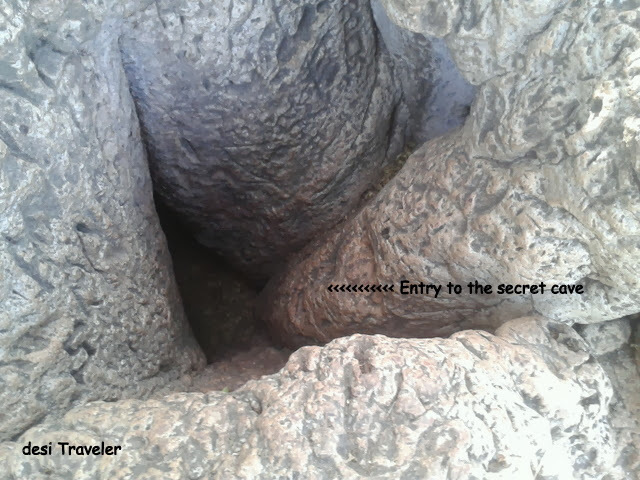 Regular visitors to desi Traveler will remember my series on the Old Baobab tree in Nanakramguda. 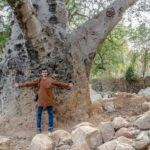 But our Baobab in Nanakramguda is a Baccha ( baby) when you look at this enormous Baobab that was planted by wandering fakirs centuries ago in Golconda. This huge Baobab tree has a circumference of 25 meters and is almost impossible to photograph in one frame at close distance. 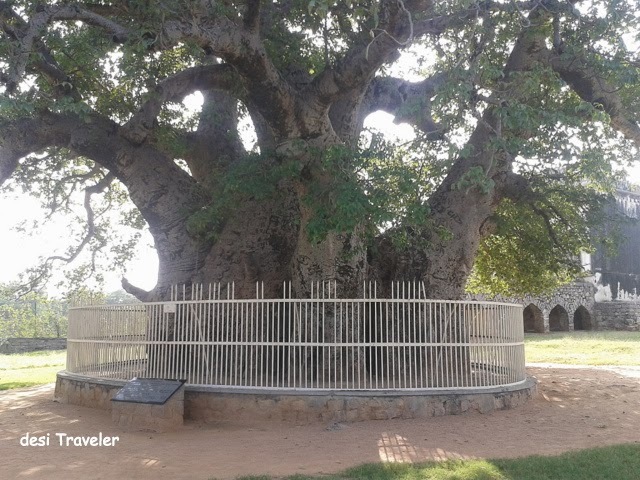 This Baobab tree is considered to be the biggest in India and could be the oldest too. 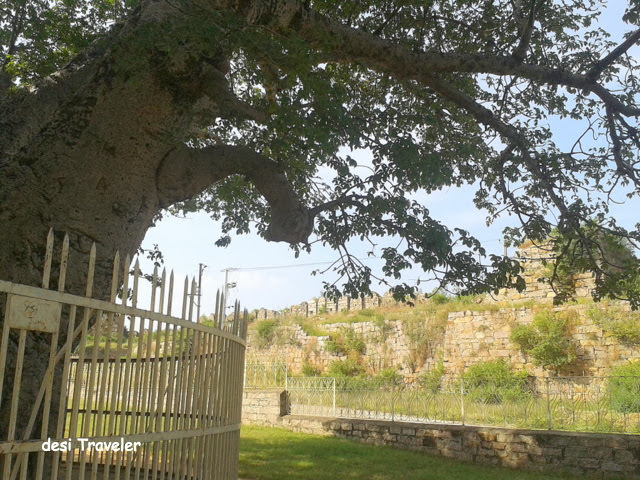 I have visited Golconda Fort many times but never saw the tree, until I realized it is in the new fort, near the Hyderabad Golf Course, which is actually a few kilometers from the Old Golconda Fort, where most tourist visit. 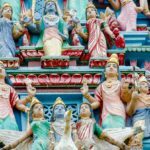 So me and my friend Ganesan decided to visit it and what a spectacle it was. With branches spreading in every direction and a stem that looks more like a group of wild elephants huddled together, it is not like anything you have ever seen. Resembling like elephant in part due to its gnarled and folded trunk and branches resembling trunk of an elephant, I could understand now why the tree is called Hatiyan Jhad or Elephant tree by the locals. Mr. Omar Bin Abdullah whom we met near the tree, looks after the tree and cleans the two rooms inside its trunk every day. 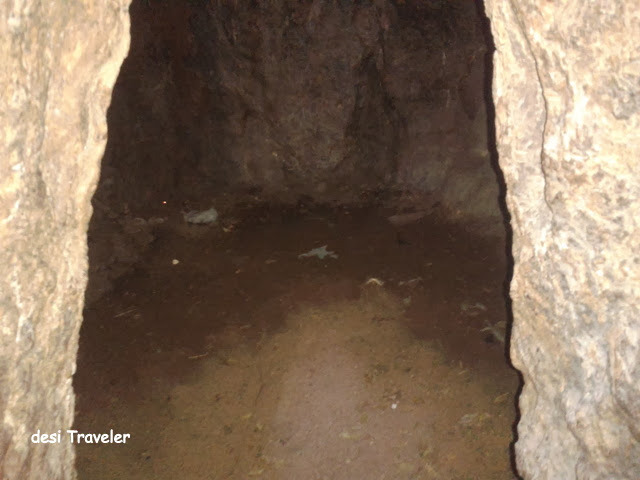 Yes Sir ( and madams too), the trunk has a hollow carved out, and if the legend is to be believed during the times of the Qutub Shahi kings, the infamous 40 thieves use to hide in the tree hollow during day, and come out in night to carry their nefarious activities. 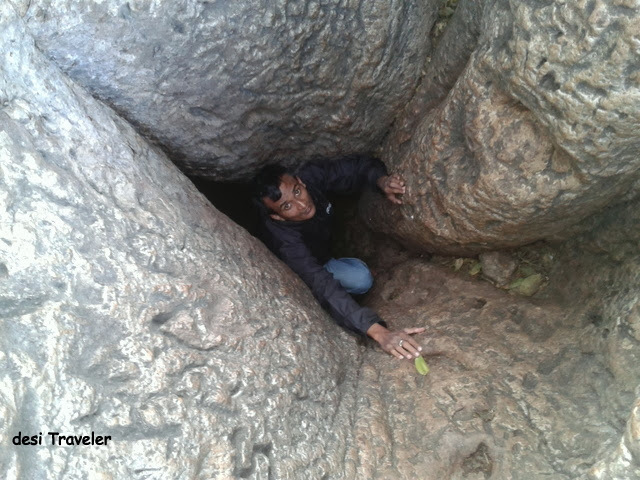 I could not believe this so decided to check it myself and after many decades desi Traveler climbed a tree, and indeed there was a small opening visible inside the trunk, but considering my girth that though no competition to the oldest Baobab tree of India aka Hatiyan Jhad, I was not sure if I will pass through it. 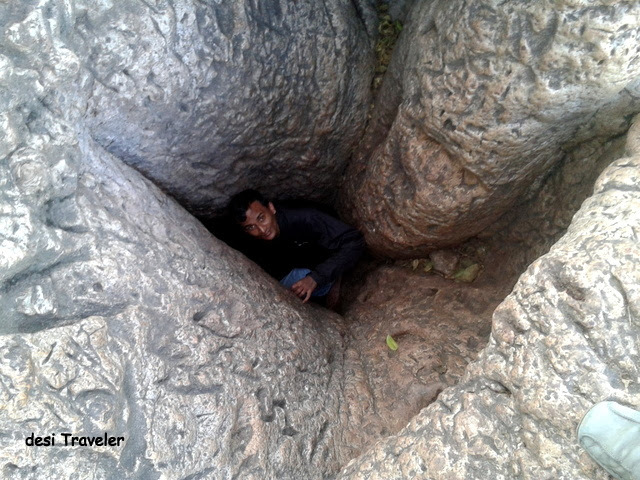 Just when I was contemplating what to do, Ganesan who can easily win thinnest guy known to desi Traveler contest, climbed and entered the vent and vanished inside, I only heard a scream from him” Yes there is a room in here“, which must have been the secret cave of the 40 thieves. I asked him if there is any booty left by the 40 thieves? But he did not answer. Mr. Abdullah, also informed about another second room above this one but we decided to give it a miss, for all you know one of the thieves may still be hiding in it! Though the chances were less as it was believed that one day the thieves were caught and hanged ( hopefully not from the same tree), and their ghosts still haunt their former abode in the tree. So climb at your own peril :). I just loved visiting the Hatiyan Jhad and hopefully visit again to take more pictures. 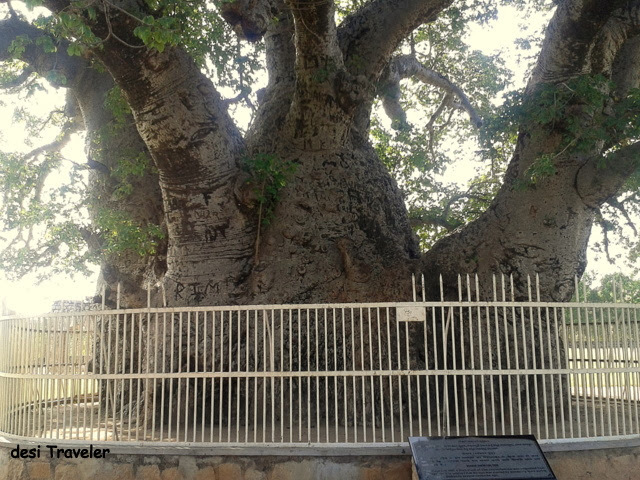 So if you are in vicinity of the Hyderabad Golf Club or Goconda fort or Qutub Shahi Tombs, try and visit the biggest Baobab Tree in India, that has seen the city grow around it and has survived the onslaught of Aurangzeb and the British Raj and still stands tall even today. The tree is surrounded by a fence and is well protected , I hope authorities do something similar about the Baobab tree in Financial district of Hyderabad, next to Ranganath Swamy temple in Nanakramguda village. NOTE: All Pics taken from cell phone as we had to leave cameras at security. Will soon upload a video also. 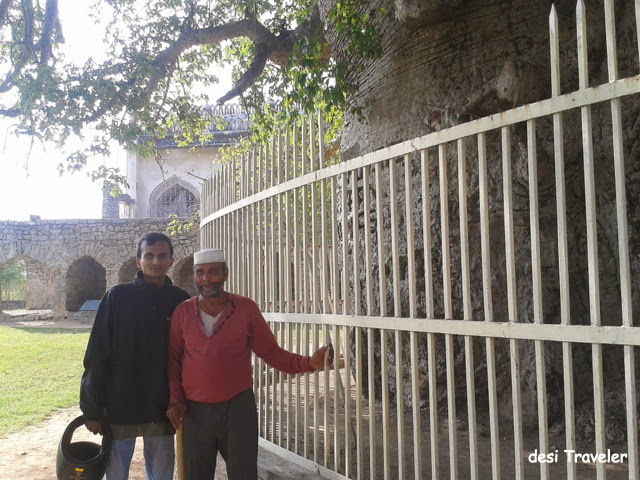 How to reach: Although it is known as in Golconda fort, it is not actually in the Golconda fort most tourists visit, an easier way to reach it is from the Hyderabad Golf Club. 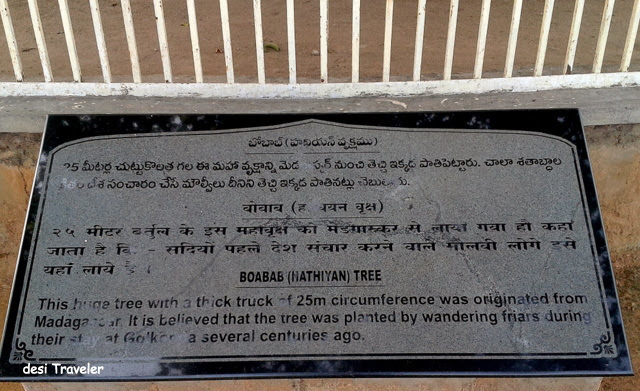 Just follow this google map to get exact directions to the Hatiyan Jhad or Baobab Tree of Golconda. Baobabs are not naturally found in India and most trees were planted by wandering fakirs as per legends, some of them are worshiped as Kalpvruksha or the wish granting tree in some parts of India. Since they are not native of India only a very few of them are found in India, and most of them are in danger of being cut due to negligence or ignorance. 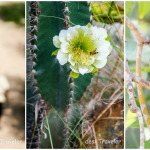 They are an important part of our heritage and must be protected. 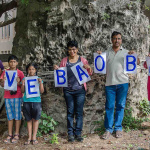 Do you know of other magnificent Baobab Trees in India ? Please do mention in the comments. There are several baobab trees in Madhya Pradesh & one of them grows in my garden.It seems pretty ancient too.I believe its origin lies in Africa. The strangest thing is that no two baobab trees are alike…the trunks are all shaped differently. You are right Lyla, Baobabs are natives to Africa and become handsome only after about 300 or so years.. 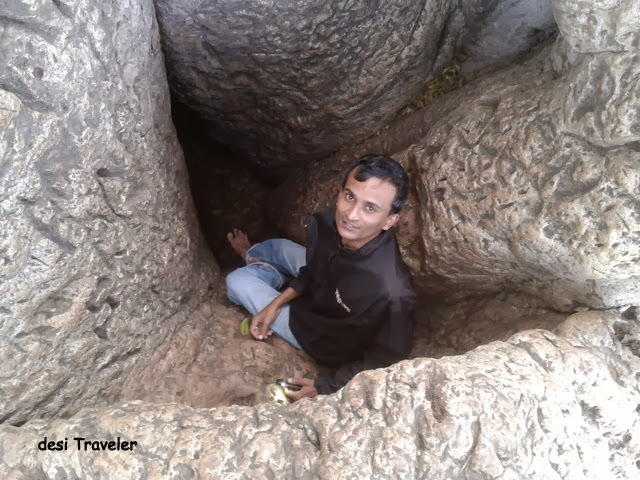 Please do share some pics and details about the Baobab Trees in Madhya Pradesh, would love to visit them one day…. There are at least couple of trees near (open ground next to) qutbullapur municipal office. I guess some have vanished now. That is interesting, I have not seen these, thanks for sharing. Wish I’d known about this tree when I visited Hyderabad! I’d love to go check out the “rooms” in the tree! This is fascinating!. First , I mistook it for the Nanakramguda one, and was happy that it was being looked after. 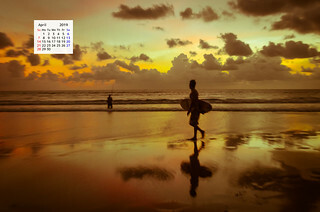 However, this is a new find, and Desi Traveler is the right person to present it , in style. Enjoyed it.